This time last year I knitted a little neck warmer from the 'Pretty Thing' pattern by Stephanie Pearl-McPhee. It was a little thing of beauty and kept my neck toasty warm without being scratchy. 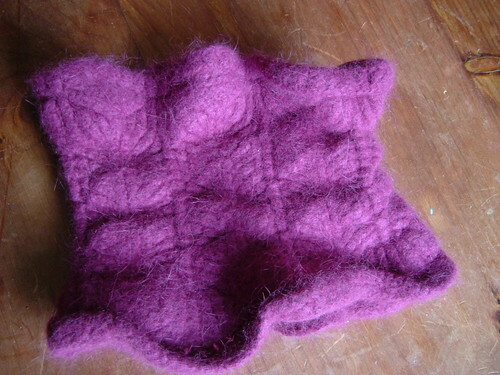 I should have known in Spring this year that it was doomed because, when I tidied up the box of hats and scarfs to put them away for the summer, the beret that I knitted it to go with (Rose Red by Ysolda Teague), had been nested in and eaten by mice. ... I would never have knitted the following projects. I loved the patterns and the yarn, and it seemed like a good idea at the time, but they've never been used. On a positive note, they didn't take long and are still really cute! I didn't want to knit anything major for Imogen in newborn size as she would grow out of it so fast, but I thought that a little hat and sock set to go home from the hospital would be nice. In reality, she was wearing a sleep suit, so the socks were unnecessary and the hat was too big. By the time it fitted, we were having a hot summer so was too hot! Pattern: Baby socks and hat by Sue Morgan. Yarn: RYC cashcotton 4 ply. This yarn makes a lovely hat and I'll probably knit another one for her in the future as I have a lot of it in stash. It's too inflexible for socks though, especially very little ones to go on delicate feet. 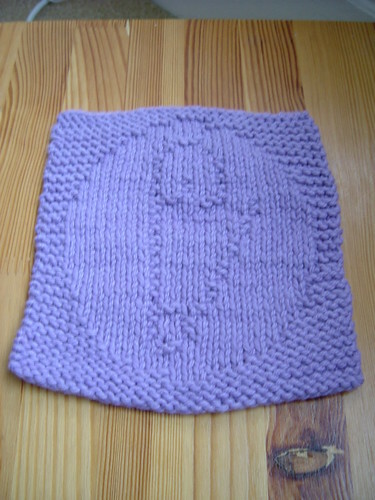 Pattern: Baby Cloths by Kris Knits. Yarn: Pisgah Peaches and Creme 100% cotton. They're in regular use now and are very handy. I'm afraid that while I'm not yet ready to resume normal posting, my little girl is now 9 weeks old, growing well and sleeping well, so I'm picking up the knitting again. Nothing spectacular, you understand, just the usual socks for the resident radiologist, but it's progress. There are also a few projects left unblogged from my LBB (life before baby). This is (barring something strange happening) my last post from a baby-free zone... and possibly my last post for a while. In addition to all the baby gifts and little bits and pieces, I've also been working on a couple of more substantial baby knits. The yarn is Jaeger Extra Fine Merino Chunky in Oak, knitted on 6mm needles. As the baby is going to be growing rapidly over the warm summer months, I'm hoping that this will do instead of a proper jacket at first. It's very stretchy and lovely and warm, and will hopefully see lots of wear. I've been working on this for ages due to yarn availability issues, but finally got it off the needles last week, crocheted the edging and blocked it. The last step was putting on the buttons yesterday. The yarn is Artesano Alpaca 100% Baby Alpaca 4 ply, knitted on 2.25mm needles. I knitted the 6-9 months size as I wanted the baby to get a decent amount of wear out of this top, considering the amount of work that went into it! The only modification I made was to crochet an edging all the way round the piece, rather than pick up and knit an edging onto the neck-line alone. Both of these projects have an unusual end-on construction which seems to work really well for baby projects where shaping isn't too much of an issue. The yarn is Regia Colour Sock yarn in Zanzibar. Knitted on 2.25mm needles and stuffed with polyester stuffing and a pile of old yarn ends. The yarn is the left-over Old Maiden Aunt Merino Sock yarn from the Resident Radiologist's scarf. 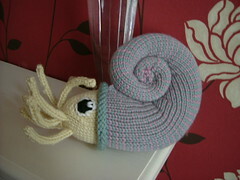 Knitted on 2.25mm needles and stuffed with polyester toy stuffing. The yarn is Pisgah Peaches and Creme in Shocking Pink and Apple Green. Knitted on 4mm needles. The longest and least interesting project in my work pile is finally off the needles. This scarf originated with the November 2009 installment of the Old Maiden Aunt sock yarn club. I unwrapped the package and my husband pounced immediately, noting that the colours were a slightly more tasteful version of his house colours from school. He already had one scarf that I had crocheted for him, which was in pretty much constant use, so another would allow for laundry breaks. 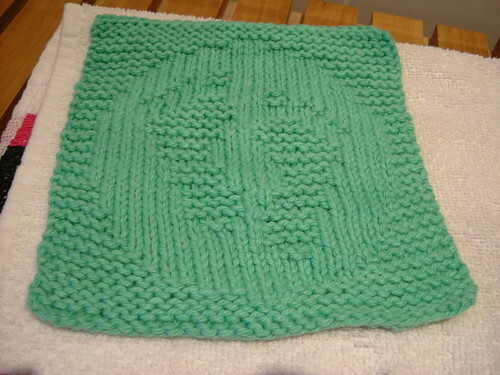 The pattern is a straight-forward 2x2 rib over 80 stitches on 3.5mm needles for 72 inches. There's a two inch border in brown at each end and the rest is two-row stripes with the yarn carried up the edge. The yarn is hand-dyed on a 100% merino base which is absolutely beautiful and has a lovely drape on these size needles. I'm thinking it looks a bit Gap-does-Eton. He likes it immensly and has already worn it, despite the improving weather. ... I can count the Textured Circles Shrug as a finished object. 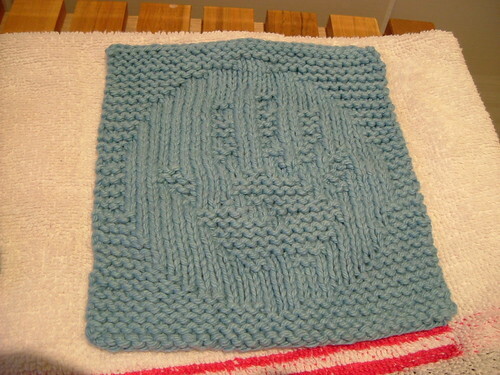 The knitting has been done for ages, but I wanted to overdye it a shade of pewter. ... food colouring paste in Liquorice and a large bottle of household vinegar. I soaked the shrug in a water / vinegar mix to saturate the fibres, then in the dye (made up in hot water and vinegar). After about 10 minutes in the dye -with agitation to ensure an even take-up - it was into the microwave to heat the dye and fibers so the dye would strike. This was achieved by way of a large salad bowl covered with clingfilm. Then it was just a case of rinsing in cool water, checking the colour and repeating until the depth of colour was what I wanted. I did the final rinse and spin in the washing machine. The colour is possibly still just on the pale side, but I've decided to live with it for a while before deciding whether to darken it up more. I've worn the finished shrug to work three times already since I dyed it - it's the perfect shape to go over a 9-month bump! There seems to have been a spate of babies lately, so in addition to knitting lots of little toys and clothes for my own bump, I've been knitting some for others as well. This is the Upside-down Daisy Hat from Itty Bitty Hats by Susan B Anderson. I knitted it in Pisgah Peaches and Creme cotton on 4mm needles. The petals were knitted separately and sewn on afterwards, but were not as fiddly as I thought they might be. I made each petal two rows longer in the central section to look a bit better proportionally on the hat size I'd knitted. The hat is a gift for a colleague of my mother's. I've also knitted another Nautie by Beth Skwarecki. My sister saw the first one I knitted and asked for one for a colleague of her's who's due the week before me. She wanted the same colours as the first one, but I didn't have enough yarn left over for the shell, so I added a lilac and striped the shell as written in the original pattern. It worked out so well that I kept the second one and gave my sister the original! I've gotten a bit behind with my blogging lately but the knitting is continuing. I'm actually making really good progress with a couple of my larger projects that I'd like to get done before the baby makes an appearance. This is the Textured Circles Shrug by Stephanie Japel. I've knitted it in Noro Cash Iroha that I bought in the John Lewis sale a few years ago now (so it almost feels like knitting for free!). Pattern - Textured Circles Shrug by Stephanie Japel (Ravelry Link). Yarn - Noro Cash Iroha (7 balls). Needles - 4.5mm and 5 mm circulars. Modifications - nothing that really matters, however, I did sew up the sleeve seams before I picked up and knitted the border. This seemed to make more sense to me that picking up the border over unsewn seams. However, despite appearances, this shrug is NOT FINISHED YET... The knitting is all done, the ends are sewn in and it fits well enough that I don't want to make any tweaks, but the colour is just not me. I knew this when I bought the yarn, but when a full pack of silk-cashmere blend yarn is on sale for a song, I could't pass it by. I reasoned that the yarn is very neutral, so once it decided what it wanted to be, I'd overdye it. I've repeatedly debated with myself whether I should dye it in skeins, or wait until it was knitted up and garment dye it and eventually went with the latter. I didn't know how many balls I would use, so didn't want to risk either too few or too many of one colour. I also think that garment dying might be a bit more even. I'm a bit of a use-the-best-tools-for-the-job junkie. I've inherited this trait from my Dad (who's a trained tool-maker and engineer) - my Mum will probably be nodding in recognition around now. I'm happy to improvise and make do for a while, but once I know that something is for me and I'm going to stick with it, I like to make a bit of an investment in the right tools. This has happened recently with knitting. I've been knitting regularly for the last 6 years and over that time my needle preference has evolved. I started out with 14 inch straight inox needles inherited from my grandmother, and added a few pairs of wooden ones in sizes that I didn't have. I moved on to socks and used inox DPNs from Gran's needle box (these are still my favourite sock needles). For small circumferences and especially socks, I now know that I'm going to stick with DPNs so have added more sizes (inox for small gauges and wooden for larger). I can do small projects on two circular needles, but don't really like it. Since I started knitting lace a couple of years back, I've acquired a few sets of Addi circular needles and like them immensly. Over time, I've found that I actually prefer circular needles to straights for all projects because the weight of the project always sits in the middle and not out at the end of one needle. Once I'd acknowledged that I hadn't actually used a set of long straights for well over a year, I decided to make an investment in good circular needles. I had a decision, either two pairs of the longest Addis in each size that I used (so I wasn't hampered by cable lengths) or a set of interchangables. I went for the interchangables. Get Knitted were offering a starter set of KnitPro interchangables with three sets of points, three cables in different lengths, and some other necessary accessories. I'd heard excellent reports of the KnitPro needles and liked that there were nickel, wooden and acrylic points available that would all fit the same cables, so in I jumped (with a few extras - more points in the sizes I use most, and some markers and cable connecter so I can make really long cables eg for edging a blanket). Knitting has definitely slowed in the last week or so, but I am still getting through project bags and making progress on my larger projects. Some left-over Debbie Bliss cashmerino aran, 3.5mm DPNs and the pattern for Nautie byBeth Skwarecki, published in Knitty. This was a really well-written pattern but the knitting was a little fiddly as the spiral shell had to be stuffed as it was knitted and simultaneously coiled. I found that no matter what I did, the stitch securing the coil was always a little on the loose side, but it didn't seem to matter in the end as the loose end from the shell cast-off is used to sew the coil in a little more securely anyway. I did make a modification to the pattern as written - instead of knitting the head as a separate piece and sewing it in afterwards, I picked up stitches inside the shell and knitted the head on as I went, stuffing it before closing it up. 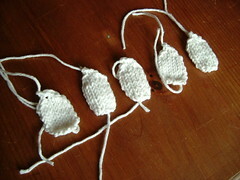 Once again, it's a pattern suitable for a newborn onwards as there are no hard bits or attached bits to swallow. My sister has seen it and already requested one for a friend of hers who's expecting the week before me - I'd better get my skates on! The project bag system is still going strong. At the weekend, I sat down and finished the knitting on the major project I've been working on for weeks (more on that another post - I've got a long way to go before I consider it a 'finished object'). I rewarded myself with another dip into the project bags and completed another little knit before I knew what had happened! This time the contents were a pile of left-over 4 ply bits and pieces, another bell-in-ball cat toy, 2.25mm needles and the pattern for the Toadstool Baby Rattle by The Purl Bee. This pattern is beautifully constructed and written and was a joy to knit. There is almost no finishing, barring the weaving in of a few ends and it is stuffed as it is knitted. The cat toy goes into the bell of the toadstool, covered in a little polyester stuffing. 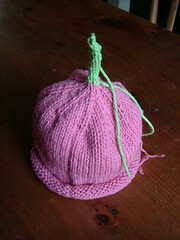 These small-project bags were intended as a reward for getting a chunk of larger project knitted, but I decided that to get the ball rolling, I would knit the first one straight off. So, what was in the bag? A ball of Regia Crazy Colour sock yarn in Jupiter, from John Lewis' sale, a set of 2.25mm DPNs, a cat bell-in-ball toy and the pattern for Celestine Sox from Berrocco. 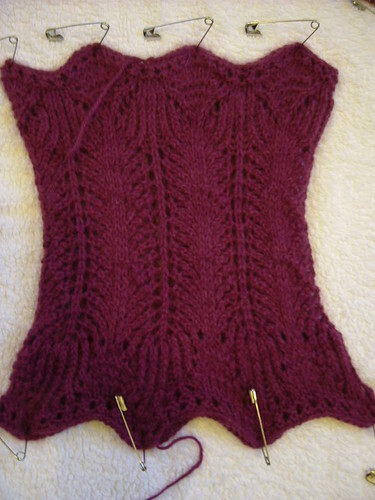 This pattern is knitted as twelve points, with each point being joined to the adjacent points with picked-up stitches. The last time I knitted this (a couple of years ago) I tried to be very clever and used a provisional cast-on to avoid the picking up stitches, but in the end it was very fiddly and the lack of a firm cast-on edge anywhere reduced the definition of the design. The first 11 points are knitted, the ends all secured and the toy is stuffed (standard polyester toy stuffing). The last point is then picked up and knitted closed with a little more stuffing added as the point grows. The finished toy should be suitable from birth as there are no sharp bits and nothing that can become detached / swallowed. It's even washable! About a week or so ago, I was reading Stephanie Pearl-McPhee's blog, and something she posted about making up her own sock clubs - essentially a series of bags, each containing all the makings of a sock - got me thinking about how to overcome my knitting inertia. The main problems as I see them are two-fold: I'm working on three projects at the moment, one is large and boring (but I'll like the outcome), the second is a very dull 2x2 ribbed scarf in 4ply (very boring but the Resident Radiologist will like the outcome) and the third has stalled, waiting for more yarn; the projects I'd like to be working on are in my ravelry queue, where I gaze at the pictures, browse my stash list for good matches, and then promptly forget the combinations by the time I get home. The solution was presented by Ms Pearl-McPhee: make up project bags containing everything required for the project. Genius. I now have a collection of about eight bags containing the pattern, yarn, needles and any extras required for (mostly small) projects I'd like to knit in the near future. All I have to do when I'm struggling to keep going with one of my larger projects is pick up a bag and get going. No thinking, no procrastinating, no indecision about yarn, just knitting. While I was in a really productive knitting spell, which lasted until a couple of weeks ago, I powered my way through over 50% of this little knitted baby cardigan. Nothing held me up, not the very fine yarn, the 2.5mm needles or the slightly unusual construction. Then I ran out of the pinky-orangey yarn. And that's when everything went pear-shaped... I started this project knowing that I didn't have enough yarn to finish it, but also aware that since I'd only bought the yarn a few weeks earlier, I would easily be able to get some more from my LYS. So, on a Saturday morning two and a half weeks ago, I went to said yarn store, only to discover that they'd SHUT DOWN two days earlier! This really came out of the blue as I know the owner of the yarn store and there had been no warning. The upbeat notice on the window said that they'd moved - TO EDINBURGH. This really isn't a move, she's had the Edinburgh store for well over a year, it's really the closing down of the Glasgow store. It's not like you can just pop round the corner to the Edinburgh store in a few minutes (and for some reason, I can't get their website to function properly on either of the computers I have access to). Then, to cap it off, it turned out that the knitting meetup which was associated with the yarn store had also been abandoned (and we were due to meet up the next week). Thankfully, some core members of the meetup group got together and organised a new venue so it will continue, but to say we felt let-down would be putting it mildly! Thankfully, there is a light at the end of this project. A knitting friend who passes the Edinburgh store regularly is going to pop in and pick up another ball of the yarn for me, and some time soon, I'm going to Edinburgh to cash in the completed loyalty cards I was saving to see me through my maternity leave. I've lost the momentum on my knitting though, and this set-back seems to have been the catalyst. I think that I might have this little baby hat pattern out of my system by now, but then again, maybe not... there are still a couple of new or anticipated arrivals that I haven't knitted for. These two were run off this week, using up more left-overs from my Rainbow Chain Baby Blanket. The blue one was requested by my Mum as a gift for a colleague who has just had a baby boy. The pink-red one is for my pilates instructor who has just gone on maternity leave and is expecting a little girl in a couple of weeks. 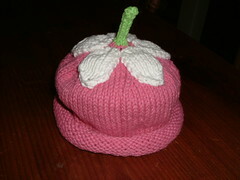 The pattern is Berry Baby Hat by Michelle Sabatier, on RandomStitches. The yarn is all Pisgah Peaches and Creme 100% cotton aran weight. I used 4mm DPN needles. I modified the published pattern by going down a needle size and casting on 72 stitches. This made 8 repeats of 9 stitches and I purled the last stitch in each repeat for a bit of texture. On the renovations front, all the major work is done and we're just waiting for the decorator to get going. Sadly, I misplaced my camera for a week so I couldn't record the changes. Some of the improvements are invisible (work done under the floor in the dining room), others aren't very striking but make me happy (proper wooden window sills in the dining room and nursery and a hinge-down hatch for the attic) and others make a huge difference (building a cupboard round the boiler in the kitchen - hiding the boiler and exposed pipes, gaining a bit of storage and covering up the many hideous strata of aged wallpaper exposed in the boiler corner). ... and a little bit of construction! I had just over two balls of yarn left over once I finished the red scarf in my last post and decided that a nice red beret would finish my winter look off perfectly. I was a little concerned that I might not have enough yarn, so first time I knitted this, I reduced the diameter slightly, and while it fitted fine, it didn't look good. In addition, there was the best part of half a ball of yarn left over. Since the total knitting time was about three hours and only represented an evening's work, I started again. The second time, I cast on fewer stitches to get a snugger fit round my ears and worked increases to a slightly larger diameter than first time round, then just followed the pattern to the last row. I added a short icord stem, instead of threading the yarn through the last round of stitches and pulling, as I think that this gives a nicer finish. This time, the beret fits beautifully, and despite still requiring a wet block on a dinner plate, I've worn it several times in the last week. The pattern is Beret by Twilleys of Stamford. 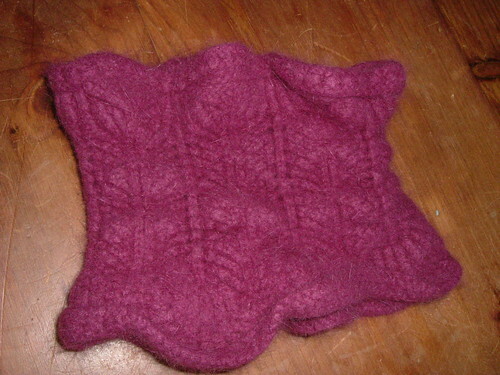 The yarn is Debbie Bliss Cotton DK (2 balls), in Raspberry (038). I used 4.5mm needles throughout (DPNs and circular). In addition to the modifications mentioned above, I modified the pattern to work it in the round. The renovations have also moved on, the day after my last post, there was a ceiling but no floor, but now we have a ceiling, a level floor and new skirting boards! Today the plasterer is skimming the ceiling and then it's really just a matter of decorating.